Casual and contract workers’ proportion to regular workers has gone up to a record 53%. Nearly 2.4 lakh workers of government-run public enterprises have lost their jobs since the Narendra Modi led BJP government took power in 2014. That’s a massive 25 per cent of the workforce. Simultaneously, the number of casual and contract workers has increased to 3.8 lakh. The proportion of such employees has zoomed up from just 36% in 2014 to a whopping 53% in 2018. This emerges from the annual Public Enterprises Survey (PES) series, brought out by the Department of Public Enterprises. Seen with the record-breaking disinvestment of public sector assets – amounting to over Rs. 2 lakh crore during the Modi rule – the gutting of what was once India’s pride, the backbone of India’s industrial economy and self-reliance, is clear. This is one of the key reasons why public sector workers are going on a two-day strike on 8-9 January 2018. The strike has been called by a joint platform of ten central trade unions and dozens of independent federations. One of the key demands of the 12-point demand charter is a stop to privatisation and sale of public sector, while another demand is for increasing employment opportunities. Regular workers declined from 9.5 lakh in 2014 (March 31) to 7.1 lakh in 2018, as per the latest releases of PES. If you add to that, about 24,289 managerial and supervisory staff that was also made redundant, the total job loss of about 2.6 lakh. In the meanwhile, number of casual or daily wage workers went up from about 31,000 to over 40,000 while contract workers shot up from 3,08,719 to 3,38,494, between 2014 and 2018. In other words, about 40,000 casual/contract workers were added. This is the period in which the government has given free rein to employers to hire and fire at will by allowing fixed term contract system in all industries. 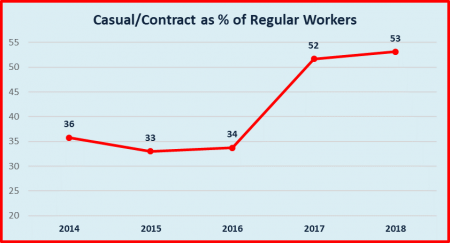 Contract and casual workers now make up about half of the strength of regular workers in public sector enterprises due to declining regular employees. Other surveys have found that contract and casual workers are paid up to 50% less than the regular workers. They are also not given most of the other legal benefits that regular employees get. This leads to enormous “savings” for the employers. In the past few years, most of the public sector employees have been on a warpath fighting to save their jobs and to protect the public ownership of key industries. 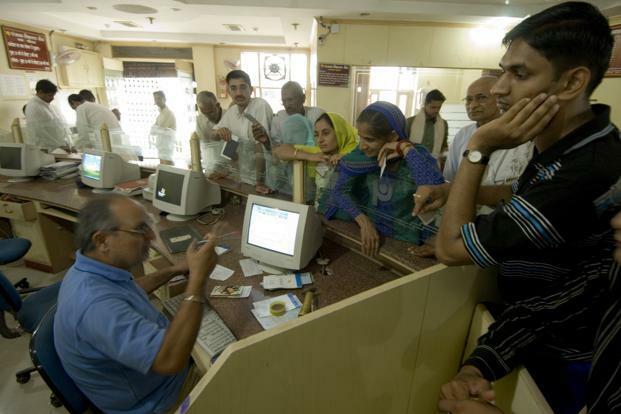 Besides such core sectors like steel, coal, ports and dock, electricity, telecom etc., banks and insurance employees, too, have repeatedly gone on strike in recent years. They will also be joining the forthcoming January 8-9 strike.